Home > Employment Law > Can I Sue My Employer For Creating a Hostile Work Environment? Do you have a manager who complains about your poor work ethic and never gives you the time off you requested? Do you have one who is disruptive or hostile, who regularly makes inappropriate comments or discriminates against you? 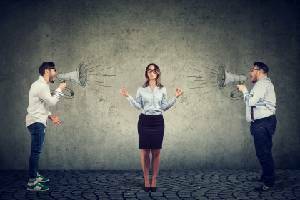 You may be considering suing your employer on the basis of “hostile work environment harassment.” Of course, doing so without fully knowing the legal requirements of what makes a work environment hostile can be detrimental, costing you time, money and potentially many awkward moments. Read on to find out if your situation is sufficient for a civil lawsuit and to learn how an employment law attorney can help. What is Hostile Work Environment Harassment? 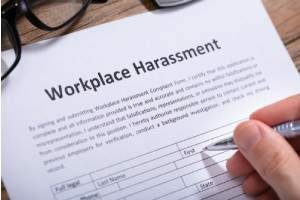 Hostile work environment harassment is a type of harassment case that employees can file in the event that their supervisor exhibits both inappropriate and discriminatory behavior toward the employee in the workplace. Remember those keywords, inappropriate: actions, behavior or communication that make doing your job extremely difficult, and discriminatory: treating you differently on the basis of protected characteristics. Keep in mind, while incidents involving routine hostile or offensive behavior is reasonable for civil litigation, small annoyances or isolated incidents are not. Thus, while many people would like to file harassment charges on the basis of rude bosses, or a lack of perks or benefits, unfortunately, this is not sufficient grounds for hostile work environment harassment. – The behavior must discriminate* against a protected classification such as age, gender, disability, religion, national origin or race. The problem must be significant and pervasive enough that it’s causing a employee consistent distress. The problem must be pervasive and not limited to an off-color remark. The problem has not been investigated and addressed effectively enough by the organization to make the behavior stop. The hostile behavior or communication must be severe in that it regularly disrupts an employee’s ability to do their job. The hostile behavior was brought to the attention of the employer and did not intervene sufficiently enough to eliminate the behavior. *A boss who verbally reprimands you on the basis of age, religion, gender, or race is guilty of discriminatory behavior, regardless of if the comments were said casually or played as jokes. To reiterate, hostile work environment harassment refers to workplace situations where the discriminatory conduct of supervisors or coworkers is so abusive and/or intolerable that it impacts the ability of the employee to do their job effectively. Thus, while a rude boss or obnoxious coworkers is not considered a hostile work environment, any of the following examples below certainly fall into this category. Discussing sexual acts or using sexually suggestive language. Telling offensive jokes about protected categories of people. Using racial slurs or insensitive terms. Displaying racist or sexually inappropriate pictures. Making unwanted comments about an employee’s physical qualities. The first step an employee who is experiencing a potentially hostile work environment should take is to simply and directly ask their supervisor or coworker to stop the inappropriate behavior. If the employee finds this too difficult, they should get help from a manager or Human Resources. You want to alert the offender that you find their behavior offensive, discriminatory and inappropriate. By communicating this, and that you don’t tolerate it, you’ll give them the opportunity to change their behavior before taking any potential legal actions. Most of the time, this will be sufficient to make the employee stop their behavior. In fact, many “hostile” employees simply do no recognize their behavior is inappropriate until someone brings this to their attention. In the unfortunate event that an employee asks for the behavior to stop and fails, there are other active steps employees can take. First, go to your Human Resources staff and ask them for help. This allows HR to investigate your complaint and eliminate the behavior on their own (one of their responsibilities). More importantly this also ensures that you brought your situation to the attention of your employer, which is a critical legal requirement of a hostile work environment case. In the event that your employer was made aware of the situation and did not sufficiently intervene, it may be time to actively file a hostile work environment complaint with the Equal Employment Opportunity Commission (EEOC). They will review your situation and determine how to proceed with necessary legal action, if appropriate, while holding your employer accountable for knowingly maintaining a hostile work environment. A employment law attorney can work privately with you throughout this process, from the complex process of filing a claim to helping to determine is your case is sufficient for civil litigation. Contact a local employment law attorney today to learn how can help with your hostile work environment case.